Valentines Day – Fall in love with a new FREE car! Posted February 4th, 2014 by CarSoldForCash & filed under Uncategorized. Valentine’s Day is coming right around the corner! Are you feeling lucky? Feel like you want to win something? Fall in love with a new, Free car! Enter to win our 1994 Mercury Topaz! It’s not fancy, we know this but a car that runs and drives can be the means of transportation that changes your life. Enter below to win! Just click on THIS LINK and fill out the entry form! Following us on Facebook, Twitter and YouTube is required but it’s not a heavy price to pay. We promise. The clients we buy cars from are always in love with their car and when we buy the car from them it’s sometimes like losing a member of the family! Fall in love with a new FREE car today. Just enter to win and fall in love with this free FANCY car! There are features to this 1994 Mercury Topaz that are just amazing. Fall in love with a self adjusting shoulder seatbelt! – When was the last time you saw one of these?! Truth be told, if you know someone who could use a set of wheels to get around in, that’s the best thing we could hope for! 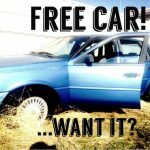 Enter to win this car for yourself or someone you know! We will be giving this car away on St. Patrick’s Day to a very lucky person! How often will you get the chance to win such a luxurious vehicle! There may be a 1994 Mercury Topaz in your future!